Jamaica is mostly known for rum and Bob Marley, but there is much more to it than these unquestionably prominent features. We landed in the North at Montego Bay's Sangster International Airport after a 10 hour flight from Zurich. On the ride to the hotel at Trewlany Beach, we could sample the art of driving a 30 seater at 60 miles per hour over streets with more potholes than most of us care to see for a lifetime. Arriving in the hotel, we were immediately taken by the forthcoming reception: Everyone gets branded with a plastic bracelet to indicate one's lodging and to entitle the bearer to unlimited food and drink on the premises. The Starfish Trelawny Beach Hotel is an "All Inclusive" Resort, meaning that you will have a severe weight problem if you are not carefull. Buffet for breakfast, lunch and dinner, booze by the gallons and exotic drinks to your liking. I found out soon enough that the "Dirty Banana" cocktail, consisting of a banana, rum cream, milk and plenty of sugar sirop agreed with me quite well, so I went by it. After a bit of hassle with countless forms we finally got to our room on the first floor. And walked right out again. It stank of urine and was right behind the band stand, so we could just about imagine the noise later on. The lady at the reception apologized but promised a new room in the morning. It did not take long to find the source of the smell. 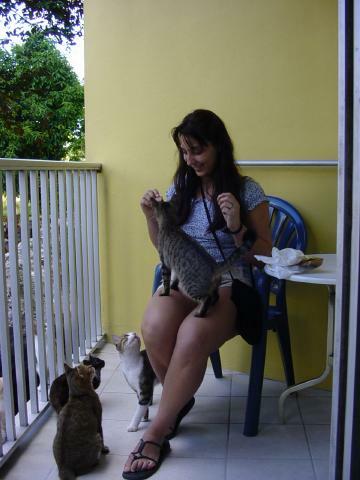 The moment we opened the balcony door, we were greeted by a group of cats which lived just below the rooms. Ina was happy about this and immediately started to flatter and feed the hungry group of felines. During the next 2 weeks, these cats would be a constant factor in our lives, even tough we left the smelly quarters the next morning and headed up to a 7th floor room with unrestricted view of a road building site behind. At our first dinner we soon discovered the nature of the main restaurant. While the food was plenty and of good quality, the actual furnishing was that of a low class workers canteen someplace in the taiga or the gobi desert. We scouted the place for a halfways clean table and went to help ourselfs. We had to fight our way through the very dense seating and finally reached the buffet, loaded up some Jerk Pork and other localities and then fought our way back. No wonder the floor was littered with dropped food, getting to our table amounted to an obstacle course between tightly spaced tables and their owners, complete with 12 head families sitting on tables set for four. With what was left of the food, we slumped into our seats and started sampling the local recipies. Soon enough both of us were grasping for the water in front of us after checking the Jerk Pork. To the best of my knowledge it consists of meat breaded with pepper and chilly and cooked that way. Caugh! The rest was quire edible tough. After 4 more obstacle courses we had managed dessert and made our way to the bar to celebrate our survival. It was short lived. The "little vibrations band" started living up to it's name and rocked the house physically with at least 110 db of concentrated reagge. We escaped towards the beach where we were immediately queried by a security guard inquiring if we had no Bally shoes, no less, on us. After getting back to the room, we donned our ear muffs and went to bed. Waking up the next day, we made the breakfast buffet and then inquired about the room change. It was a day of "come soon" meaning anything between right now and in 2 weeks. At 5 pm we finally left our cat's box and entered the elevator to the 7th floor. We were in for a shock. Every time we passed the 4th floor, a shattering "CLANC" and a sudden stop of the elevator became our daily routine but was a bit of a shake the first time. We reached our new room and found that the window could not be locked. While Ina pointed out quite rightly that only a bird could make it into our place from that end, I took out my Swiss Army Knife and put things in order. After 2 hours or so, we were ready to call it home. Day 3 finally brought beach and fun and not much to do. The gale force winds had the red flag flying, the sea was rough but tolerable as a water massage. The fine sand was less so, as it got us "breaded" in no time. It was time to do something, so we booked a shopping tour to Mobay as Montego Bay is called by the locals. We quickly found the Jamaican way of trade. In front of every shop, one or more Jamaicans were standing and competing in loud sounds. I found a t-shirt that would have been usefull: "Which part of NO don' t you understand? I don't need my hair braided! I don't need a taxi! I don't need a t-shirt (apart from maybe this one)! I am NOT hungry. I don't need a "smoke" (here meaning marihuana)". I was sorry I did not buy it! If you can't take hassling from dealers, stay away from Mobay and the markets. 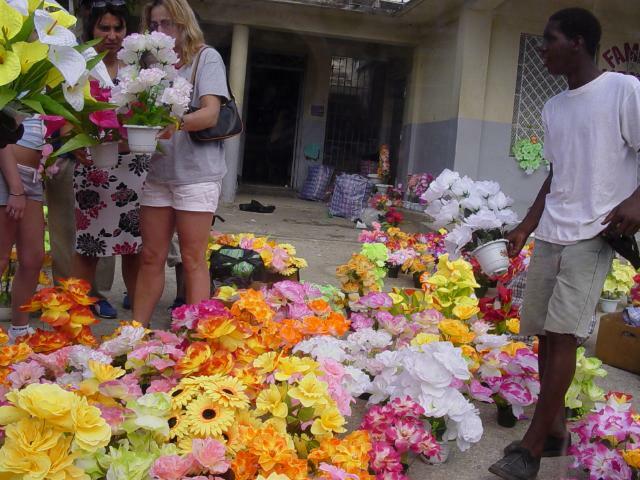 On the way back, 2 Canadian friends we found made the bus stop in a local village to buy some plastic flowers. in no time they were surrounded by 7 to 9 Jamaicans all shouting at them. Ina to the rescue! Like a Lara Croft on one of her better days she launched herself into the madness and started to sort out and haggle with the mob. Our driver started crossing himself before hurrying back to the bus. But they all survived, Ina got the price down to something the Canadians found acceptable and they were bundled back into the bus which left with a flying start, getting some of the driver's compatriots to jump for cover. After this experience we had enough of being dependent on other people's wheels. We started ringing the car rentals and found a pretty good deal with Budget after a bit of discussion. They were even ready to bring the car round two days later so we happily retired to the beach for 2 days and tried to be early at the buffets. Having wheels of our own changed the outlook and got us cursing the idea of not having thought so earlier. 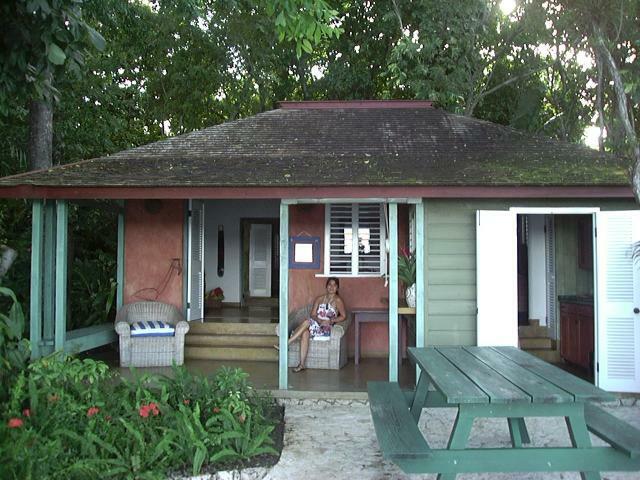 The first day we took off to Rose Hall and Greenwood Great House, two exceptional plantation homes near Mobay. 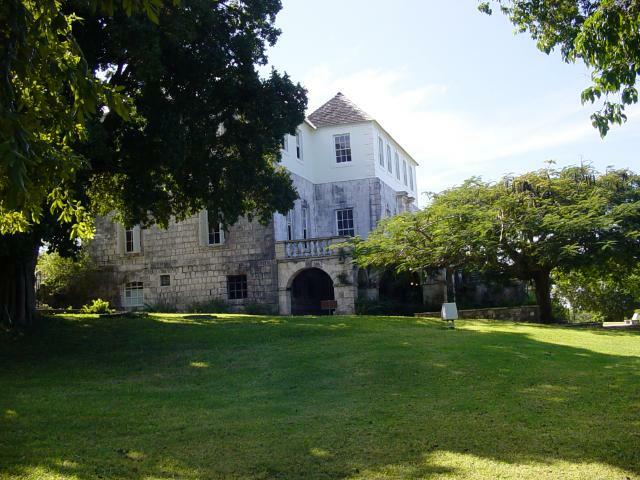 Greenwood House is located off the main street from Trewlany to Montego Bay and is the only Great House not having been burned to the ground during the Slave Uprising. It features a lovely interior and gardens, including a library with several first edition Dickens books. We were taken around by a lovely girl in period uniform and shown all the niceties of the house. The interesting bit is, that this house is still a home to a family which lives in these antique surroundings. 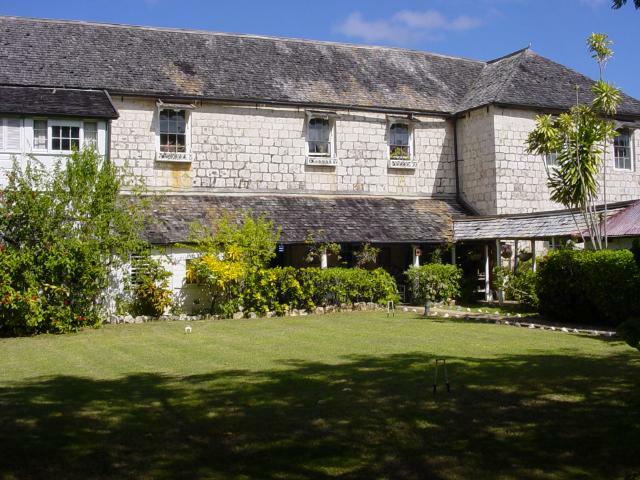 Rose Hall is another Great House that was totally reconstructed by an American family in the early 20th century. It had been a quite notorious place as for one of her alledged owners, Annee Palmer, "the White Witch of Rose Hall". From what is told of her, she murdered no less than 4 husbands and an unaccounted number of slaves. Despite the claims that she did not exist in reality, she roams the house as a ghost and her toomb outside is marked with Voodoo Symbols to keep her inside. Nice tourist trap but still good fun and lovely gardens to boot. 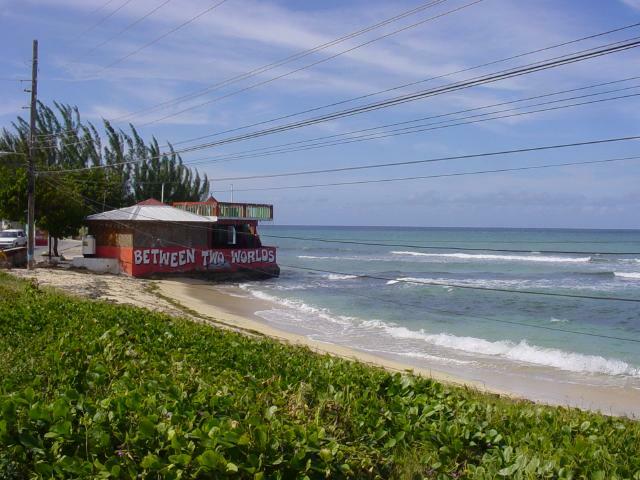 The next day we set out to Ocho Rios, a cruise ship port to the east of Trewlany. There we met with American friends who had been very helpful in setting up my Internet account for the time of my stay. Marty and Margot Bush own a condo in Ocho Rios and we enjoyed a pleasant afternoon with them before continuing back to the hotel in the evening, once again savouring the skilled roadshow by the local drivers. 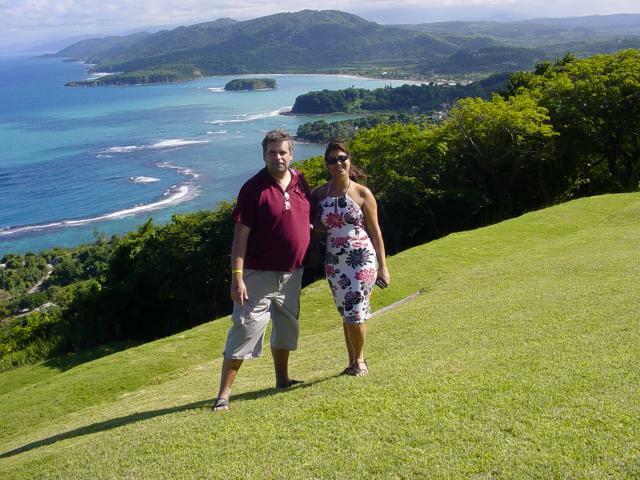 Another great trip lead us to what I belive to be the most beautiful spot on Jamaica. 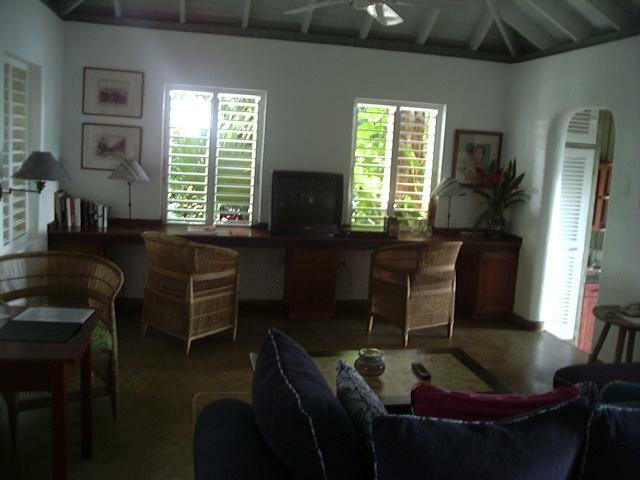 Playwright, composer and universal talent Noel Coward built a small paradise on top of a hill east of Ocho Rios. "Firefly" as he called it for the thousands of fireflys that are visible there, was Coward's home for many years. He received lots of distinguished guests up there, including the Queen Mother. The story goes that on that occasion the complicated feast Coward had prepared failed, so he heated a can of pea soup to the amusement of the honored guest. Noel Coward, known for songs like "Mad Dog's and Englishmen" and many plays and music, was also an accomplished painter. In his house, many of his works are exhibited. Coward died at Firefly of a heart attack and is buried on the grounds. 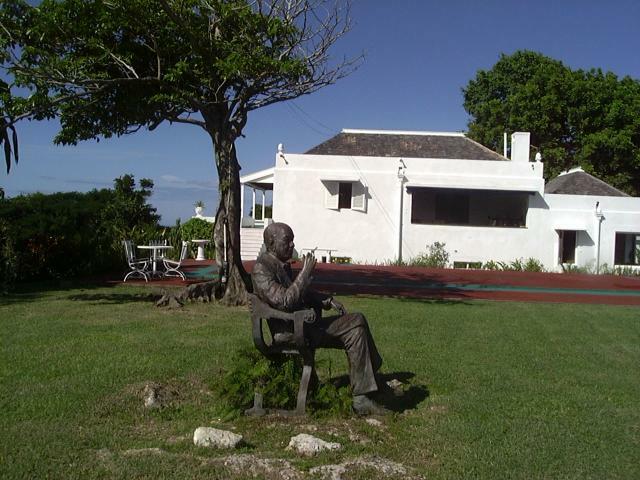 A statue showing him sitting on a bench overlooking the sea has been erected in front of his house. Firefly is certainly a MUST SEE for anyone in Jamaica, however, it should be pointed out that a 4WD is a good idea on that road or at least a very sensible speed should be driven. On the way back from Firefly we managed to find one of the most exclusive resorts of the island. "Golden Eye" is the former estate of James Bond author Ian Flemming. Most of the novels were written on these premises, which today are a hotel of special sort. It is easy to imagine 007 in any incarnation to be sipping his vodka-martini, shaken, not stirred, on the terraces of one of the extravagant but simple homes of the resort. Goldeneye features the main house, the Golden Palm cottage and 3 villas, named after Bond Girls Honeychile, Tiffany Case and Domino, and Romanov, Solitaire and Vesper. Here's Ina on the porch of Honeychile. Click on the picture to see the website of Goldeneye. Goldeneye's room rates are steep, but there's plenty in return. Full accomodation with a different kind of "all inclusive", no plastic bands here! Instead, the menu of the resort restaurant features lobster and vintage champaign. 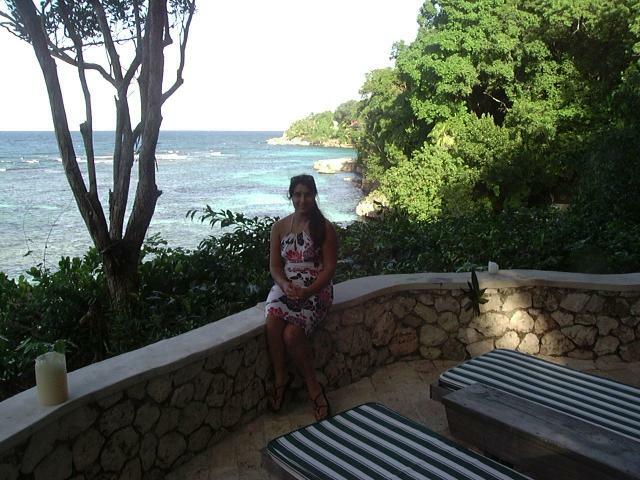 Ina is sitting here on the porch of one of the villas, from where a small staircase will lead you down to your private beach. Also included are watersports and a beach on a private island just outside the hotel. 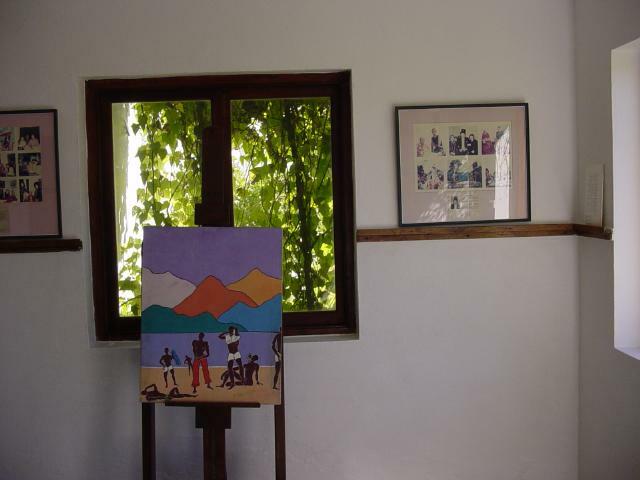 Click on the picture to see more of this villa. The only little problem to the likes of us are the room rates. They start around 700$ US and end near 3500$ for the main house... per day! The good news is, that this is for the whole thing, there can be as many as there are beds in the room. Who can afford this? Well, it's quite easy to find out. Goldeneye let's you put a monument to yourself of the special kind. You can sponsor a tree for 300$ and have your name written on it. So if you want to be placed next to Sean Connery, Naomi Campbell or Roger Moore, here is your chance. Click on the image to see what Naomi thinks of the resort. We also saw the trees of Brad Pitt and "Pirate" Johnny Depp. At this point we would like to thank the staff of Goldeneye for giving us a thrilling visit to this unique place. Would I stay there if I could afford it? YOU BET! What to buy from Jamaica? Ina went all out to find out for you. She recommends pottery and paintings. Even tough the one on the left is not for sale (it's by Noel Coward) it gives you an idea of some of the styles you may expect. All in all, Jamaica is great fun for a while as long as you don't confine yourself to your hotel and let the plastic band be your handcuff. Don't believe all the horrorstories about the driving and the criminality. They are true, yes, but that does not mean you need to stay under the covers of your bed. It is not more dangerous than, say, New York City or any other carribean island. Liked this report? Send us your comment here!